I’m finally sharing the third (and final) project I finished over Christmas Break. I was done sewing on the last day of Christmas Break, but I’ve spent the past couple weeks obsessing whether or not one of the hems is straight. It is…I’m just crazy. 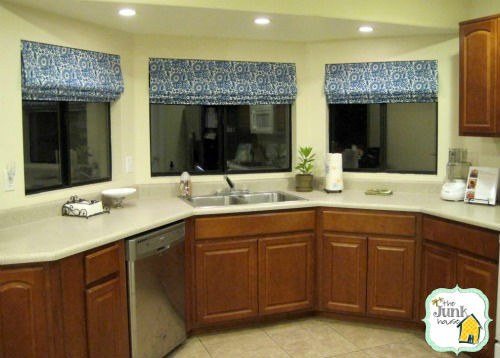 Anyway, I’ve been planning to sew window treatments for the kitchen since I painted in there (April). I searched and searched for the perfect fabric. 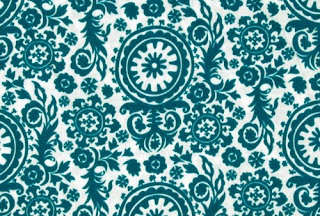 Finally, I found something I could live with and ordered 3.5 yards of Premier Prints Indoor/Outdoor Royal Suzani Blue Moon fabric. It’s indoor/outdoor, so hopefully it won’t fade as quickly. It’s thick, so I didn’t have to worry about lining. It was wide enough (54”) to cover the large middle window. I love me some teal and white. So, I’m not going to write a faux roman shades tutorial. Imparting Grace already has a great one out there. In fact, it was her genius idea to use tension rods! I saw the idea on Tatertots & Jello and she got the idea from Richella at Imparting Grace. Blogs are definitely a great place for sharing/finding new ideas! The middle window is 47” wide. The cheap tension rods extend to 48”, but the middle sags when extended that far. I had to buy a heavy duty tension rod for the top, but the cheap ones still worked for the folds because you can’t see the sagging under the fabric. This is the window I was obsessing over. What do y’all think? Is it even? One last shot because I’m so happy I finally have window treatments in the kitchen! And that they’re finished…it seriously sucked making these! I almost gave up and paid someone to make them for me! These look great! I love the pattern and color you piked out! 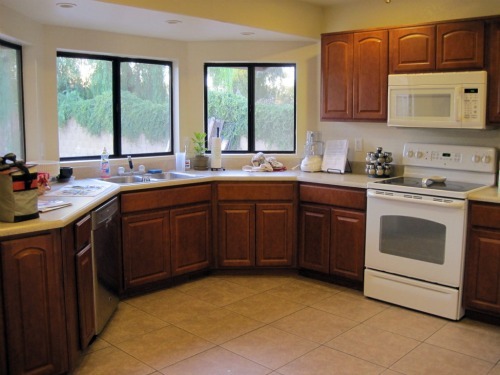 The color adds so much POP to the kitchen! You rocked the price also!!! Sam they look brilliant, I'm so impressed you had the patience to do make them all. And yes the hem is straight! sam, they look FAB. and blue and white is classic! always in style. WOW! What an awesome job...I personally LOVE the fabric!! Please come share tomorrow over at Passionatelyperfect.com!! Please come to my house and show me how you got that to work! Mine did an epic fail nose dive and your's turned out AWESOME! I love it! And the colors are fantastic! Boyfriend will like it after awhile too. They always do! White and navy... sigh... true love! Your boyfriend is crazy. That's the only reasonable explanation because that fabric is gorgeous. And you did a great job. I made some for my kitchen and they look all wonky and crooked. Thank you for linking this to my party! 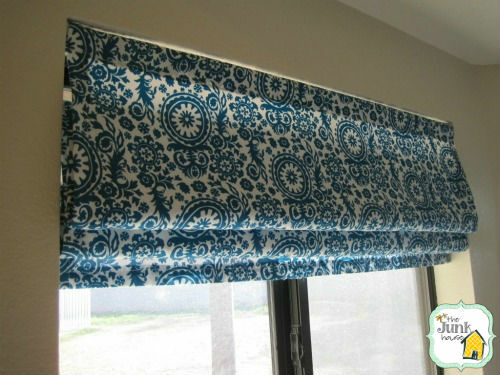 I've been wanting to make 2 faux roman shades, but have been dragging my feet. Yours looks great and has reminded me I need to get to work on mine! 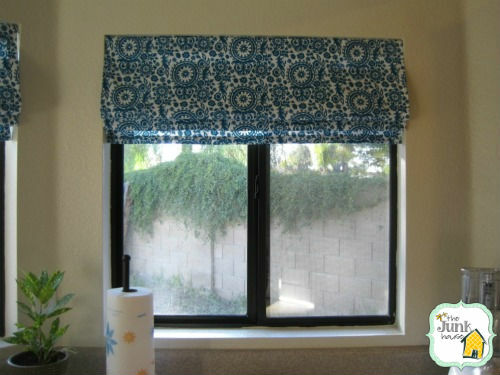 That's a great fabric and they look wonderful on your windows! Nice job. I think they look wonderful! I'm glad the tutorial worked for you. And thanks so much for letting me know about them--they're just beautiful! That was a LOT of window treatment work to do--kudos to you for persevering! These are great! I love the color. I have this new obsession with teal! I'm hosting a linky party, the theme is all time favorite post- would love it if you joined in!